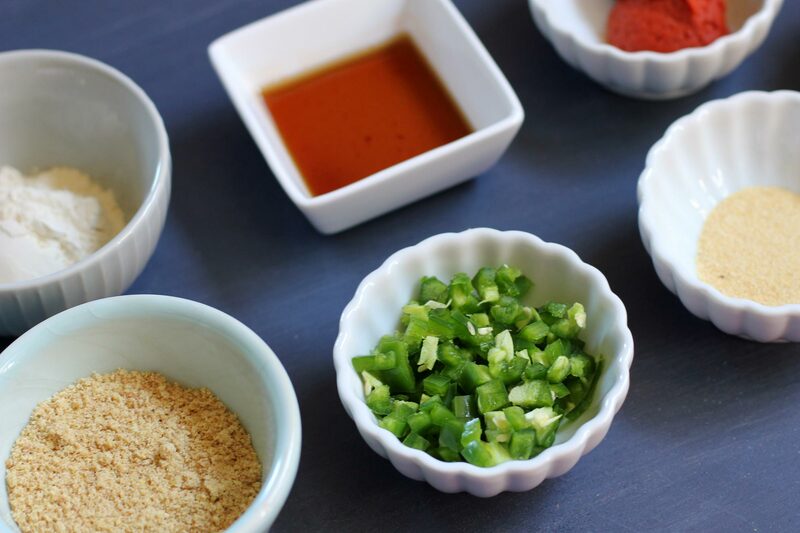 A gluten-free Thai turkey burger without any panko breadcrumbs or eggs! I was beyond frustrated at the clinic yesterday because my fax service wasn’t working. I spent four hours trying to fix the problem, including a 40 minute long phone call to tech support. The tech support guy was really nice. I didn’t have anything in me to be curt with him, but internally, I was ready to strangle someone. I have very little tolerance when I lose “work time”. All those hours spent trouble shooting my fax, when I was supposed to be working on email consults, charts, follow-ups, and superbills. Sorry if you think I’m slow. I could be “working” now, instead of writing this blog post, but my work day started at 8 am today and ended at 5:30 pm, which is enough for a day. I’m still trying to let go of the fax situation from today, even though the turn of events led me to divorce my old fax service and sign up for a new one. My office has a new fax number now, which is updated on my website. Even though those four hours were spent working, I was working for my practice’s business operations, and not on what I wanted to be working on, which was my to-do list. Fixing the fax system was not on my to-do list. So now, my to-do list is basically the same, but I have a much better faxing service. As you can see, I’m still adjusting to small business life. I run a private micropractice outside of Seattle. I like being small, specifically so that I have time to write, work on recipes, and make videos. But, the downside of not working for a bigger clinic, is that I don’t have someone to fall on when something goes wrong. Last week, it was my vaccine fridge. I was at the clinic last Monday until almost 10 pm, babysitting the temperature on my vaccine fridge (because my vaccine fridge was acting up). Lost a lot of work time that day, too! I’m going to go open my archerfriendly cafe now. Just kidding. A cafe would have it’s own set of business fires to put out in the day to day operations. Can’t get away from it. Although I really do want my own archerfriendly cafe… some day. 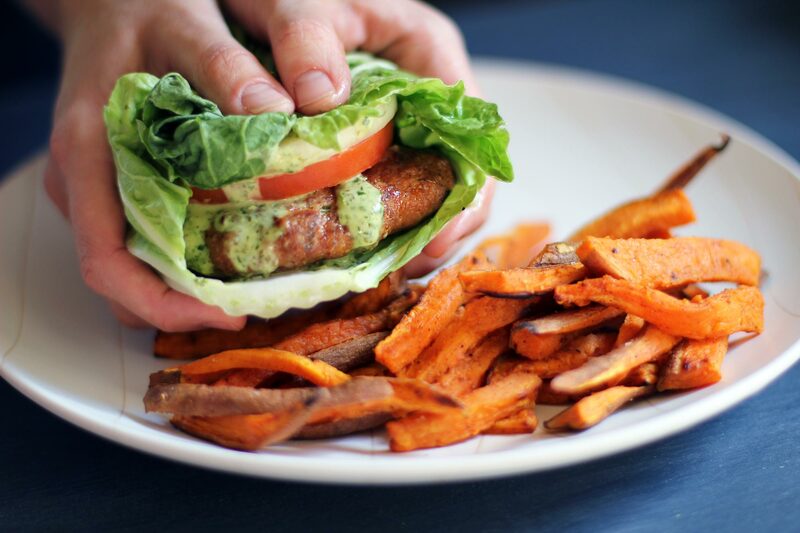 If the archerfriendly cafe was up and running, these Red Thai Turkey Burgers would be on the menu because they WORK. At least I have something going for me in these past two weeks! 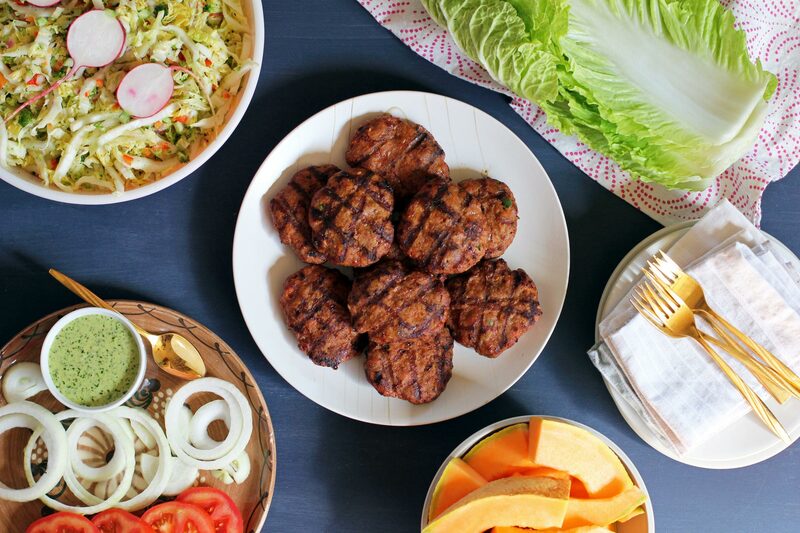 I usually pair my Red Thai Turkey Burgers with Adele’s Napa Cabbage Salad (recipe coming soon), which is how I would serve it up in the archerfriendly cafe. If you start with a large head of napa cabbage, you can use the outer leaves for your Red Thai Turkey Burger wraps and the inner leaves for a napa cabbage salad. That’s why I pair them together — both are Asian styled and less food waste. Place all ingredients in a food processor. Blend well. Note: This does create a thinner sauce, but I use vegan soy-free mayo which is not as thick as regular mayo. You can thicken it with collagen hydrolysate (cold tolerated gelatin that does not congeal). Mix all ingredients in a large bowl by hand until they are evenly spread throughout. Shape into burgers by first forming a ball that fills your hands cupped together. Turkey burgers can be compressed much more than beef burgers without becoming tough on the grill. You actually need them to stick together well and not fall apart, so work them hard before shaping them. Place burgers on a lightly oiled pan or plate. This sheen of oil on the bottom will really help them not stick, but be careful of any flare-ups while on the grill. Heat grill to about 350° F (medium heat), then place the burgers on the grill. After about 6 minutes, give them a quarter turn for nice grill marks. After about 4 minutes, they should be holding together pretty well and ready to flip. After about 8 more minutes, pull one off and check its internal temperature. Once the burgers are at 165° F, they are done. 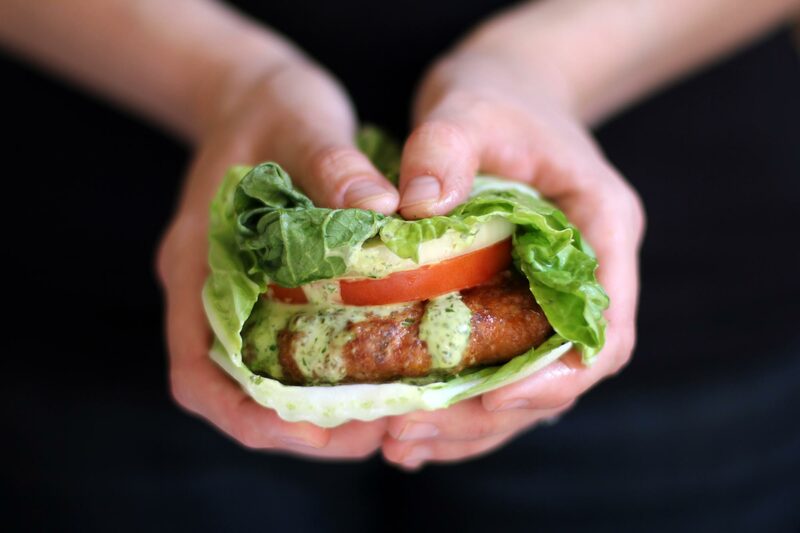 Wrap a burger with an outer napa cabbage leaf, add toppings and cilantro lime aioli.